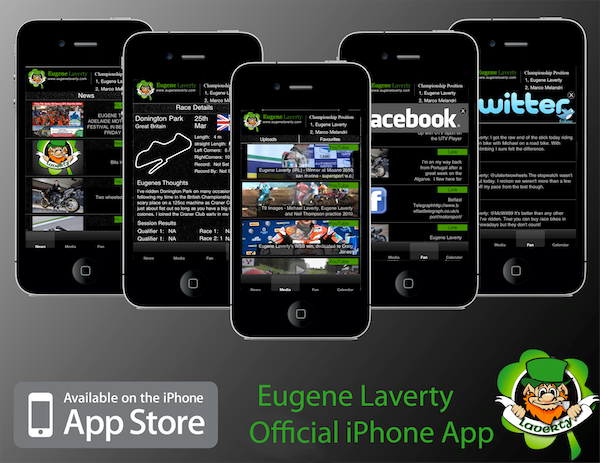 Yamaha World Superbike rider Eugene Laverty has become the first rider to launch his very own Iphone app. The all new app will give fans the opportunity to keep up to date with all his results, blogs, videos and personal news. Subscribers will also get access to the official Yamaha press releases plus a host of other exciting features. Laverty, is an avid social media fan and was one of the first riders to start tweeting. He said: “The plan is that it will be updated at least three times over race weekends, so users can jump in at any time and see how we’re doing on the track. It’s an extension of my website, but something that you can access anytime, wherever you are in the world. The app is priced at £1.19 and is available for download now.